Racomitrium sudeticum has yellowy-green to dark green or nearly black, irregularly-branching plants. Stem length varies greatly. The leaves are narrow and tipped with fine hairs (to 0.5 mm long) that are either inconspicuous or absent. R. sudeticum has egg-shaped and distinctively short-stalked sporophytes. R. sudeticum forms dense carpets 2-10 cm tall on rock and soil in heaths from subalpine to alpine elevations. It has a circumpolar distribution in the Northern Hemisphere, and in western North America is found south to the Sierra Nevada in California. Many species of this genus look similar, including yellow-green rock-moss (Racomitrium heterostichum), R. occidentale, and R. brevipes. The short egg-shaped capsules and short, inconspicuous hair tip are distinctive features of R. sudeticum. Bosanquet, S. Racomitrium sudeticum. British Bryological Society. Accessed 06/10/2014. 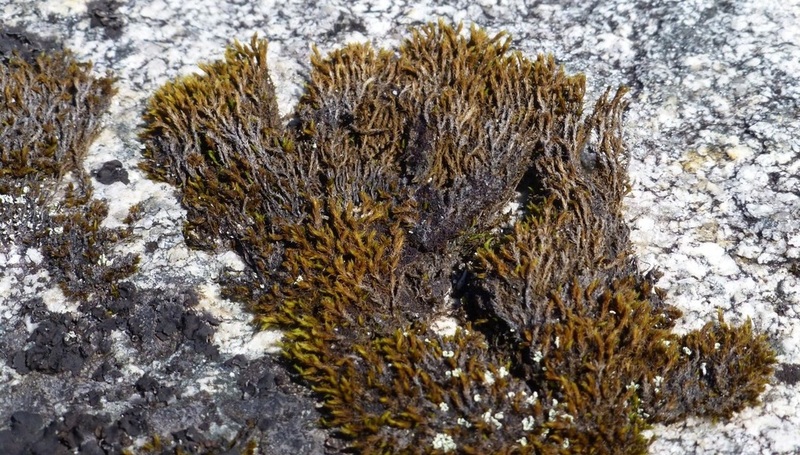 Racomitrium sudeticum (Funck) B. & S. in B.S.G. In Klinkenberg, Brian. (Ed.). E-Flora BC: Electronic Atlas of the Plants of British Columbia. Lab for Advanced Spatial Analysis, Department of Geography, University of British Columbia, Vancouver. Accessed 06/10/2014. Wagner, D. (2007). Racomitrium sudeticum (Funck) Bruch &. Schimp. in B.S.G. Guide to Racomitrium of Oregon. Fernzenmosses. Northwest Botanical Institute, Eugene, OR. Accessed 06/10/2014.